The first is a no-brainer. 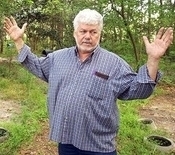 In 2004, David Tant went to prison after dog fighting paraphernalia, torture devices, and animals with grave injuries were found on his property. Though sentenced to thirty years, Tant is now up for parole after only six, thanks to what his state considers “non-violent” offenses. The offender is David Tant. His SCDC number is 306170. Please do not grant parole to David Tant. His repeated maiming and killing of innocent animals represent a deeply disturbed mind and indicate a strong likelihood he will continue to torture and kill if released. Tant remains a serious risk to society and I ask that you consider the welfare of companion animals and humans alike. Thank you. The second item is a bit more complicated. The ASPCA has teamed up with several local groups to create a dog fighting DNA database. The idea is that DNA profiles of dogs involved in dog fighting will be stored in a digital warehouse. Prosecutors can then use the information to convict individuals involved in dog fighting cases. Sounds great, right? Potentially it is. If the technology is truly used for the reason described, and helps put an end to dog fighting, then this is a brilliant development in the struggle to end this barbaric practice. Some animal advocates are concerned, however, that the genetic coding will be used to further the effort of breed specific legislation (BSL) – in other words, the banning of Pit Bulls and other misunderstood breeds. The owner of a loving Staffie, and a staunch supporter of the bully breeds, I’m against BSL. Instead, let’s ban dog fighting and institute a no-tolerance policy toward any human who participates in any way. This isn’t the first time scientific developments have led to controversy. Let’s keep on top of this issue and ensure this advancement serves those deserving of its benefits.